Last week, I wrote about our belated holiday party at Quilt Night. I didn’t get a chance to explain what I’m working on at Quilt Night now that my Bride's Bouquet quilt is complete. Probably about 20 years ago, when I was still new to quilting and even before the Bride's Bouquet quilt, I stopped into a fabric store and saw a lovely ivory-colored sheer fabric accented with pink roses, small blue flowers and green leaves. I realized the fabric wasn’t durable enough to stand up on its own in a quilt, but I also knew a bit about crazy quilts — that the colorful fabrics were sewn onto a simple backing and all of the embellishment meant that the crazy quilt wouldn’t be subject to the hard use of a standard quilt. With a vague plan in mind I picked out some coordinating fabrics, both traditional cottons and additional sheers, as well as some white muslin. I found a few skeins of embroidery floss, beading thread, beads and buttons. 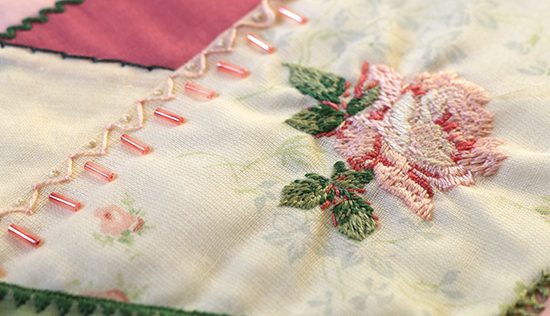 A traditional crazy quilt is made from random scraps of all kinds of fabric. 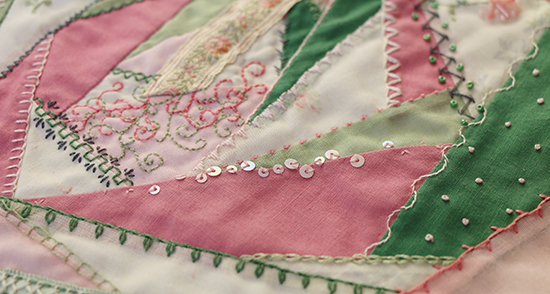 Each seam is covered with embroidery stitches, and beads and buttons are used for further embellishment. 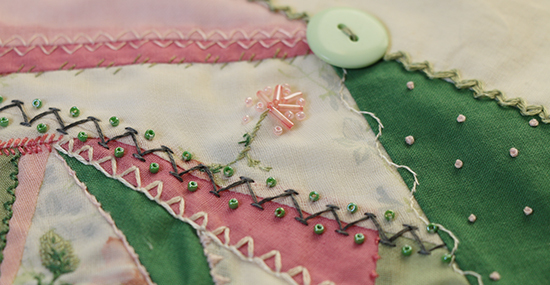 My crazy quilt is a little more structured in that I chose specific fabrics and embellishments within a narrow color scheme. The foundation blocks are 11 inches square. I believe my logic in choosing that size was that the muslin was 45 inches wide; it allowed me to make blocks with the least amount of waste. I’ve sewn up eight blocks so far, four starting at the corner and four starting at the center. At some point, I decided I didn’t want the block-making to get too far ahead of the embellishment. The embellishment on the fourth block is almost done — or, at least, done enough to move on to the next block. I have a feeling that after I’ve gone through all of the blocks, I’ll go through them again to add more embellishment. It’s the type of project that could go on as long as I wish. I haven’t yet decided how the blocks will go together, although I do have some fabric set aside for a border. The border fabric isn’t in any of the blocks, and should set them off nicely. It’s a fun project. It’s nice to let my mind wander and hand-stitch whatever feels right at the moment. I think the reason I haven’t worked on it more is because it can require a certain amount of setting up and spreading out, particularly when I want to add beads. Once again, the project that doesn’t travel well gets overlooked. What are your thoughts on crazy quilts? Have you ever tried making one?